I do love a good underdog story. I have to say I’m really grateful they responded to adversity the way they did. We’d have been robbed of so much beauty if they’d succumbed to the pressure from the popular kids. And so I guess you could say the first lesson they’ve taught me is that I shouldn’t let fear of judgment keep me from doing what I know I was put here on this earth to achieve. There might be some people who reject me for it, but the truth is that the world would be missing something vital if I weren’t myself. The same is true for you. 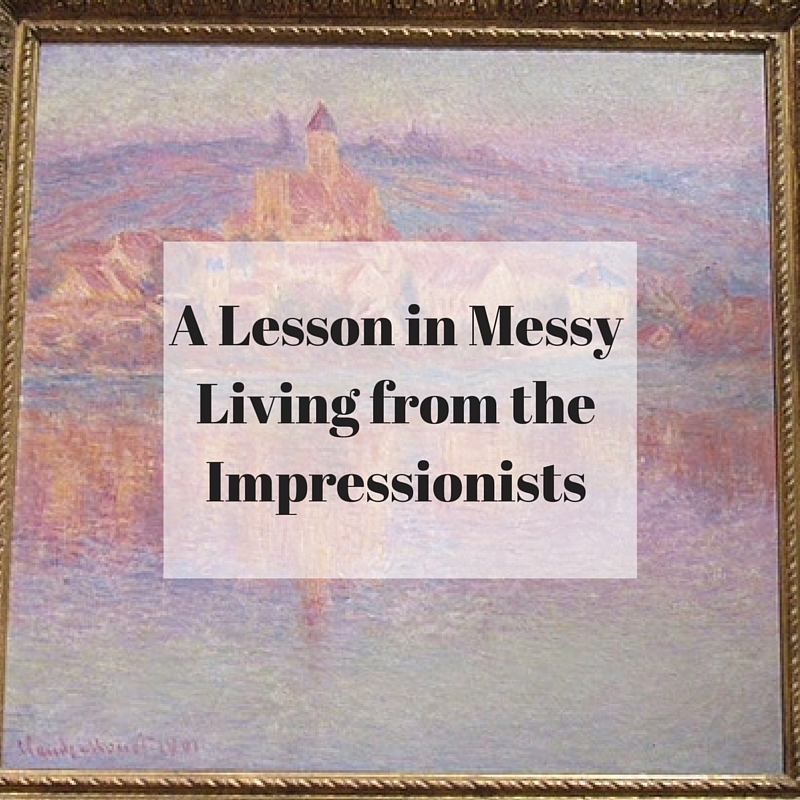 Have you ever noticed how messy some of the Impressionists’ paintings look? Though each of them is governed by a unifying vision, so that you can definitely tell what it’s depicting when you admire it from afar, stand up close to the canvas, really scrutinize it, and you’ll see something different. You’ll see haphazard brush strokes, irreverently juxtaposed color combinations, and no deliberate use anywhere of black or white. Where these colors seem to occur, they’ve sprung organically from others, the result being works of art infused from corner to corner with color and radiance. When I visited the Art Institute during my travels to Chicago this past weekend, a woman admiring these paintings with her husband said it best: they were luminous. 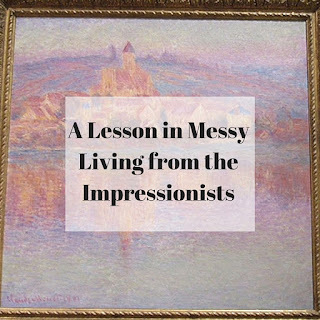 When I consider how the messiness of the Impressionists’ works might be something of a guide to how our own lives should be lived, I want to go deeper than concluding that their paintings are a metaphor for how our own flaws can make something beautiful of us. Because the way I see it, we’re made to do more than passively accept our flaws. If we want to live truly luminous lives, we have to actively use our flaws and stumbles to light up the world. We have to make our wounds the instruments with which we write powerful new narratives that will change our own stories, and those of others. As an example, I’ll tell you about my sister Lizzy. In the spring of 2014, she was hospitalized and diagnosed with ulcerative colitis, an autoimmune disease that could have permanently crippled her self-esteem and happiness had she submitted to the feelings of weakness and fear it wrought. But two years later, she’s used her illness to leverage her health and wellness (she’s run three half marathons, battled her way through BeachBody’s 21 Day Fix, and continues to make choices that make her feel strong and confident) and encourages others to become their best selves in similar ways, and she uses her story to support others suffering from the same condition. She’s the happiest I’ve ever seen her, and she’s lit from within by an unmistakeable glow. Just like the Impressionists who used those messy strokes to create shimmering works of art, Lizzy used her “flaw” to shine in an extraordinary way. And this is what the Impressionists have taught me. Like the Bible verse that reminds me that “[God’s] strength is sufficient for us, for power is made perfect in weakness,” (2 Corinthians 12:9, NAB), I’m reminded that those things others perceive to be “wrong” with us, the weaknesses and struggles you and I face, can become the very place from which we engage and inspire the world.